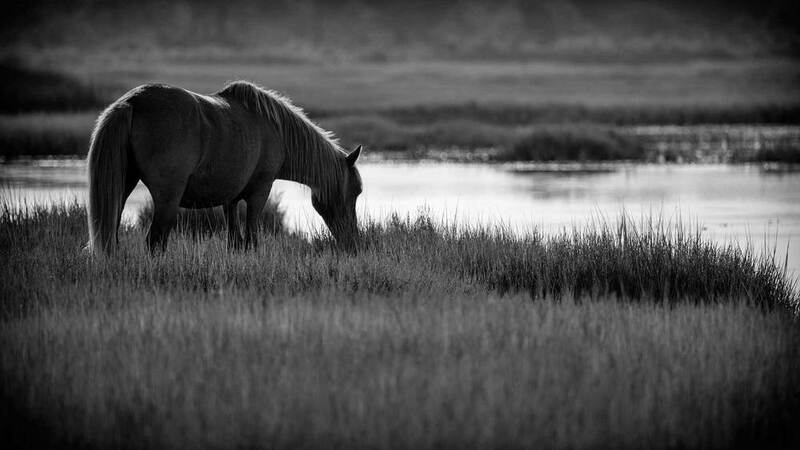 During my recent trip to Assateague Island, one of my goals had been to get a serene photo of a horse grazing in the marshes. I knew the horses tended to go inland to the marsh during the day, but in several days of shooting, I'd had limited success seeing any horses that I could get close enough to photograph. On our final day at Assateauge Island, we set out at 7am in hopes of catching a brief glimpse of morning activity. As we arrived in the marshes, we saw a herd of horses grazing in the marshes - exactly the shot I'd wanted but had been loosing hope of actually getting. The horses were moving slowly as they grazed on the swamp grass, giving me plenty of opportunities to move around and vary the lighting on my subject. At one point I was able to get in a position that isolated one of the horses by himself. The sun was just above the tree line, hitting the top of his neck with a soft glow of light. I immediately knew the image would look best in black and white and I adjusted my exposure slightly with the final image in mind. I shot a wide depth of field to capture all the detail and texture of the grasses and intentionally underexposed the horses body to highlight the soft light on his neck and back. The final image was adjusted in Adobe Photoshop CS6 and converted to black and white using Nik Silver Efex Pro 2.